What is a 10x Marketer? A 10x marketer is someone who generates at least ten times the value of an average marketer. Of course, 10x marketers don't necessarily produce 10x the value or save companies 10x the cost of labor, but the point is that 10x marketers are significantly more effective than their average counterparts. 10x marketers may produce anywhere from 2x to 100x, but regardless of this math, they are extremely valuable. All it takes is one 10x marketer to completely change your organization. That's because 10x marketers tend to impact multiple areas of business outside of marketing. Plus, their passion, dependability, and helpfulness are contagious to those around them. Imagine hiring a marketing professional who understands the nitty gritty of marketing tactics, has the ability to execute on their own (but is still flexible enough to work in groups), sees the big picture well enough to communicate with executives and understand how their work affects other departments, and knows how to build scalable systems to replace time-consuming tasks. That is a 10x marketer. Now imagine you have an entire team of 10x marketers. What could your organization accomplish? Although people often speak of 10x marketers like some mythical creature, they are readily available for the right companies. 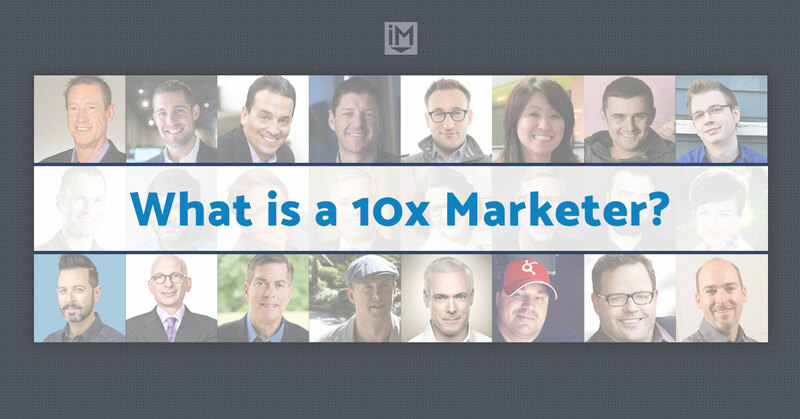 In fact, at IMPACT, we like to think our entire team is made up of 10x marketers. But when it comes to your business -- do you know how to spot a 10x marketer when you see one? Keep reading to discover the shared characteristics of most 10x marketers, from their natural talents to their learned skills. To some degree, 10x marketers have an unfair advantage over their traditional counterparts. While most of their positive attributes are learned skills, there's no denying that 10x marketers have raw talents and qualities that you simply can't teach. Passion has become such a buzzword that we often forget the difference between having a strong interest in something and having true passion. People who are passionate by nature tend to be so about many things, not just one particular hobby or industry. 10x marketers have the type of passion that you can sense in a single conversation, and that passion is contagious. Their passion makes them more inclined to spend time learning and developing their skills. It also makes them more willing to take on new challenges and ultimately, become powerful leaders who inspire those around them. Passion is one of IMPACT's core values and it's something we've found truly integral to growing our organization and achieving success. In the last several years, we've seen this big debate in the business world about working hard versus working smart. The truth is you can't outsmart laziness. Whether they're driven by the passion mentioned above, pride, or something else, 10x marketers produce more value because they have the grit to outwork everyone else. Other marketers might possess the same knowledge and skills as 10x marketers, but work ethic is often the "10x" differentiator. How often have you discussed a new initiative with your marketing team on a Monday and by Friday, you still haven't even seen them take the first step? When a 10x marketer gets the green light on a project, they don't wait until next week to get started -- they start today! That sense of urgency and enthusiasm that 10x marketers have is energizing to the entire team and builds momentum within an organization. 10x marketers get more results because they get their work done quickly with plenty of time to spare for improvements. Truth is, it's difficult to find someone producing 10x or 100x their competition that doesn't have a positive outlook on life. Those who set lofty goals are often called dreamers, but 10x marketers believe those dreams can become a reality. In addition to providing them with the confidence to take risks, optimism also tends to spark creativity. 10x marketers are more innovative because they often test ideas that more pessimistic marketers would have written off completely. The average marketer is content with using a generic buyer persona that hasn't been updated in a year or two. A 10x marketer is obsessed with better understanding your ideal customers and refining your buyer personas. 10x marketers have a deep understanding of what drives your customers, how they think and talk, what they like most about your products or services, and even what TV shows they enjoy. They go beyond analytical data into the psychology of your customers. Even after creating a buyer persona, the 10x marketer is always learning from your customers and updating their assumptions. They are more effective because they know more about the target market than others do, and most importantly, they genuinely care about the people they're marketing to. Average marketers tend to pick one or two skills to specialize in, either because they enjoy those tasks more or because those jobs pay better. The 10x marketer is happy to wear many hats and develop a wide variety of skills. As the digital landscape forces businesses and marketers to adapt quicker and come up with better solutions, there's a higher demand for people who possess knowledge of multiple areas of business. Rather than expecting everyone to adjust to them, the 10x marketer goes out of their way to learn more about the finance department, the sales department, the engineering department, design, development, and so on. As a result, when the 10x marketer proposes a solution, they not only know how to pitch it in a way that gets approval from other departments, they've likely already considered the needs of those departments as well. 10x marketers get 10x the results because they're thinking beyond their role, which allows them to make better decisions. Instead of focusing blindly on increasing revenue, they strive to create actual profit. 10x marketers are unique in that they will persist to no end when they believe they've figured out something that works -- but they are also quick to completely drop a project that's doomed to fail without wasting unnecesary resources. Businesses need marketers (and other employees) who aren't afraid to challenge the status quo and break new ground. 10x marketers are different from average marketers because they aren't rattled by criticism or apathy from others. When the 10x marketer is on to something good, they will persist until the opposition finally gives in. On the other hand, 10x marketers understand the difference between a downturn and a dead end. The second a 10x marketer realizes their strategy isn't working, they will quit and figure out a new solution. They don't wallow, they pivot. The average marketer is stubborn and wants to persist so they can prove themselves right or simply gets discouraged when it doesn't work out. The 10x marketer dusts themselves off and gets back to work. They are persistent about finding the best solution because they want to be right. A lot of marketers are worried about marketing automation because they fear that it will ultimately replace the marketer -- but this isn't true. While automation produces exponential results in a fraction of the time, we still need humans to build and optimize our marketing automation systems. Not only do 10x marketers excel at creating automated marketing systems, they understand how to automate positive customer experiences. Automation works best when it doesn't feel like automation for the customer, but personalized. That's where the 10x marketer's understanding of your ideal customers and ability to wear multiple hats both come into play. 10x marketers never have to worry about replacing themselves with automation because they know they are irreplaceable. In fact, the best incentive for a marketer to become a 10x marketer is greater job security and significantly higher pay. Good talent is rare and companies will do whatever they can to hold on to a 10x marketer. 10x marketers combine the best tangible and intangible qualities of great employees, alongside a wide selection of marketing skills, to produce dramatically more value than the average marketer. They might sound too good to be true, but they're out there and ready to work for organizations that will give them the autonomy and flexibility to think bigger and test new ideas. If you have marketers on your team with the raw talents, you could already have potential 10x marketers that simply need a little more time to develop their skills. Once you identify those people and invest in them, you will start seeing the 10x results you need. Want to work with 10x marketers right off the bat? I'm proud to say our team is made up of dozens of them. Talk to us and we'll uncover how they can help you take your digital marketing and business to the next level.